As always seem to have a multitude of models on the go. They’re sitting at various stages of complete, but some need more work or motivation than others and get reprioritised in favour of something that’s a bit more inspiring. I decided that I wanted some dedicated close combat terminators and as part of a job lot of figures ended up with some Cataphractii Terminators. 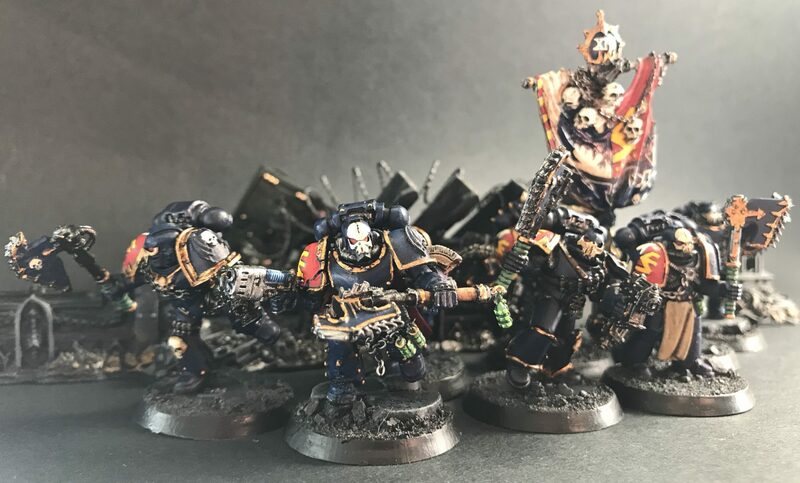 These one are all equipped with a pair of lightning claws and in addition to these I’ve five chaos terminators who are going to get clawed up too. Plus I’ve started gathering bits for some thunder hammer and storm shield troops too. When you’ve been into 40k since the game came out and your engagement with the hobby has ebbed and flowed with time, you begin to forget what you read and when and indeed whether the memory of that was something that has been warped by the passage of time. Anyway at some point back in the day, I’m fairly sure that one of the traits of the Night Lords were plenty of jump pack equipped marines. Having been slaughtered at the hands of some jumpy Ultramarines in Games Workshop Norwich in the late 1990s it was clear that I needed some, so I’ve gradually being amassing units. One was actually painted previously, but needs an overhaul and thus those below are the first unit. Yes, another ten man squad. These came out of a job lot of figures I acquired and were preassembled and primed in chaos black. I liked the poses and the terror squad heads so they went straight to paint, no mods. Five of the troops are equipped with chainswords and bolt pistols. I can live with that, there’s going to be plenty of variety so I can live without chainaxes on this occasion. I’ve been feeling the need to have a go at weathering, so tried some on the chainsword bars. I used a dark purple and then two shades of silver. I think that the effect needs some more work, but it’s a start. The other five troops in the unit carry power maces – not my power weapon of choice, these are not 40k monks or tech priests. That said, I will cast aside my ecclesiastical association with these weapons and hope they will be equally useful in smashing their way through armour. It might be the first one that I have posted here, but this is another tactical transport for the troops of the 19th Company. I’ve developed the insignia I trialled on the Rapier Mortar to provide some monotone chapter markings to the bullet riddled hull. 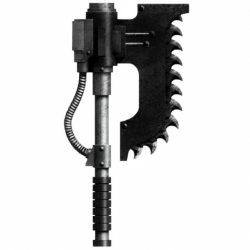 It’s not a Chaos Rhino unless it has a lot of spikes. This one has plenty, plus a fully painted interior and a few subtle mods like the I-beam front bumper.